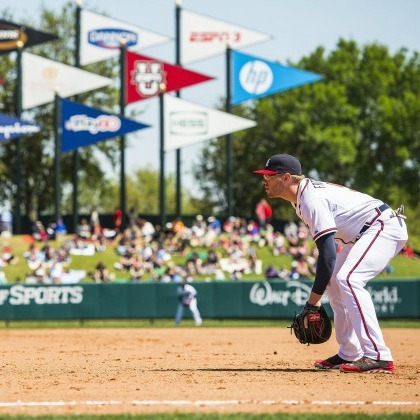 POSTED: Wed, 12/31/2014 - 06:00 | POSTED BY: Traci C.
The Atlanta Braves are returning to the ESPN Wide World of Sports Complex for the 2015 spring training season and will play an 18-game schedule against some of the top teams in Major League Baseball. This is the 18th year that the Braves have held spring training at the Walt Disney World Resort. The spring training games start in early March and run through early April and include four night games on March 14, 18, 31, and April 2. The Braves host the National League East champion Washington Nationals on March 6 and play the American League East champion Baltimore Orioles on April 2. The New York Yankees are on the schedule for March 18. The team reports to Orlando for two weeks of training starting in mid-February and the first game is Wednesday, March 4 against the New York Mets. The Braves will face the St. Louis Cardinals on March 11, and the Detroit Tigers are in town for three games on March 7, 13, and 22. All of the spring training games feature in-game entertainment, Disney character appearances, and special fan experiences. Individual game tickets are available at the Braves' website braves.com/springtraining and at the ESPN Wide World of Sports Complex Box Office. Prices range from $14 for general admission lawn seats to $54 for lower level reserved seats. Yay! I know people who have been waiting for this. It's going to make their day.